An old gown, with new sleeve ruffles and petticoat. The biggest difference is in presentation. I ended up making a changeable blue silk petticoat to dress up a cotton print gown, to which I’ve added sleeve ruffles made by the incomparable Cassidy. While I once had plans–dreams–of finishing and wearing the silk sacque in time for this, I was overtaken by events and have settled for an ensemble more suited to my persona, and Mr S’s planned outfit, the Saratoga coat and breeches. I feel just OK with center front closing cotton print for late 1777, and have seen enough cotton print gown and silk petticoats at Williamsburg to brazen it out. This is a marked upgrade from linen petticoats that smell like woodsmoke (sigh!) and print neckerchiefs that you shouldn’t smell. All cleaned up with someplace to go. I started this day with wet hair, curlers, setting lotion and bobby pins, swearing like a sailor and convinced/hoping the world might end right in our bathroom. Last night I watched Jenny La Fleur‘s 18th century pouf tutorial, and thought I had the basics down. Wrong. Or half-wrong. I should have gone looking for a don’t-lose-your-mind video, plus one on how to make pin curls in exacting detail. True to my ability to over-think anything, I began to wonder which way I should spin the pin curls– clock wise? Counter-clock wise? Is it opposite if you’re in Australia and New Zealand? My brain is a cluttered place. In under an hour I had achieved a lop-sided mound of curlers and curls, which I thoughtfully covered with a kerchief to spare my family from death by Medusa. They refused to take me to Walmart, though I finally had the hair for it. Eventually, I pulled out half the bobby pins in the known universe, and had a head full of snakes. Silver snakes. Apparently there’s more grey in my hair than I realized. Another half-hour of pins and hairspray later, I had a slightly more upscale version of my usual hair style, accented with a shiny green ribbon. 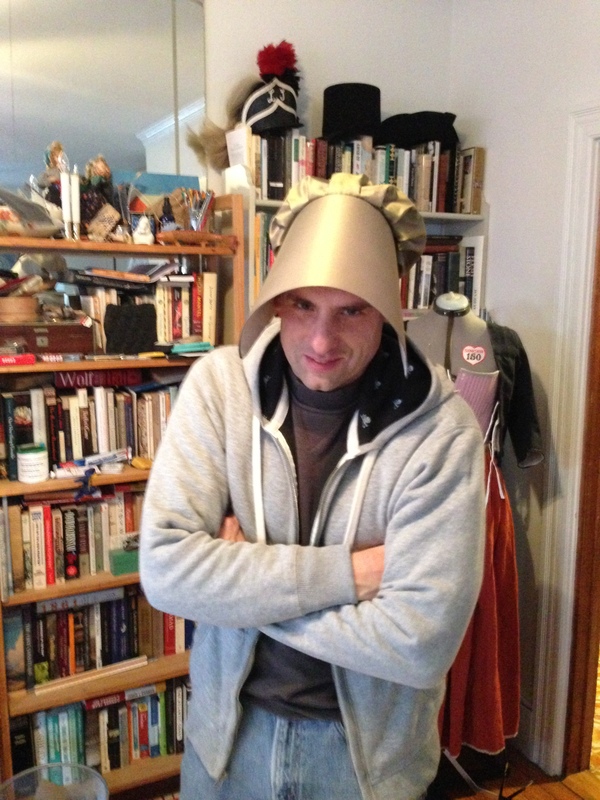 Underneath that demure cap, my hair is doing terrible, feral things. Of all the things I learned today, I know with certainty that despite my small head, the next time I’m gonna need bigger rollers, and when I get home from the ball, I must wash my hair. 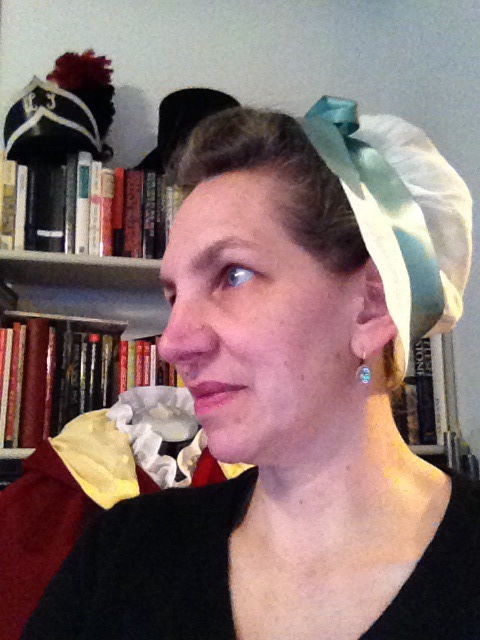 To help get myself out of a sewing rut and panic, and a general malaise, I made a bonnet. A ‘Quaker’ bonnet. Bonnets are like cupcakes: delicious, sugary, but lower in calories and committment than a full garment. Quaker women in the late 18th and early 19th century did not, as far as I can tell, wear the black ‘sugar scoop’ bonnet we now associate with Quakers. There are numerous entries in Amelia Gummere about bonnets, and types of bonnets, and the reflection of particular sects of Quakers in the pleating of the bonnet caul. But early in the 19th century, at the dawn of the Age of Bonnets, Quaker and non-Quaker styles seem to have been closer. The fashion plate from the Museum of London presented a style that I thought I could approximate, and that made sense to me for 1800-1810ish, but I chose an olive green silk (actually yellow and black sort-of-changeable taffeta) because I have seen Quaker bonnets in olives and tans, especially earlier bonnets. Going with a color that was less distinctive, and a form that was undecorated, seemed to me to strike the best balance between plainness and style in this time period. 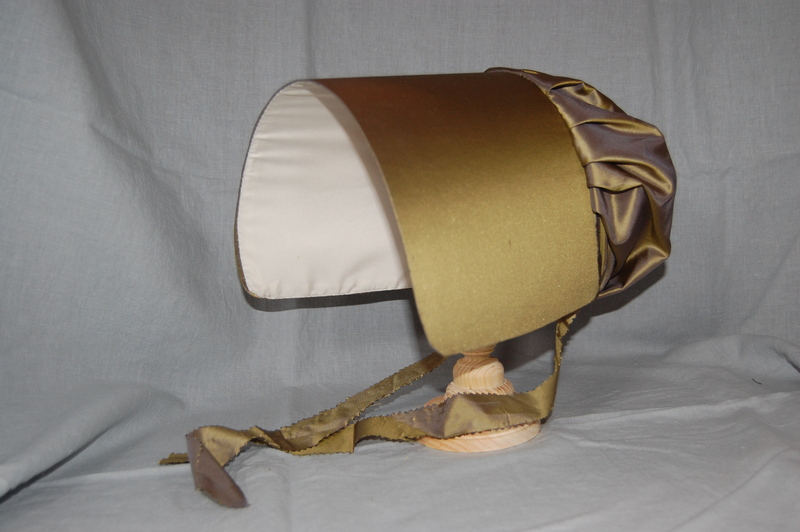 I chose this for innovation because the new bonnet forms of the early 19th century are departures from the full, round, pudding-on-the-head styles of the late 18th century, and the Quakers took it a bit further. In standardizing the appearance of their bonnets (simple, unadorned, eventually ossified in form and signaling sect in pleat patterns), the Quakers were innovators in clothing as outward symbol and sign of inner faith and affiliation. There’s your rationalization, how about some facts? 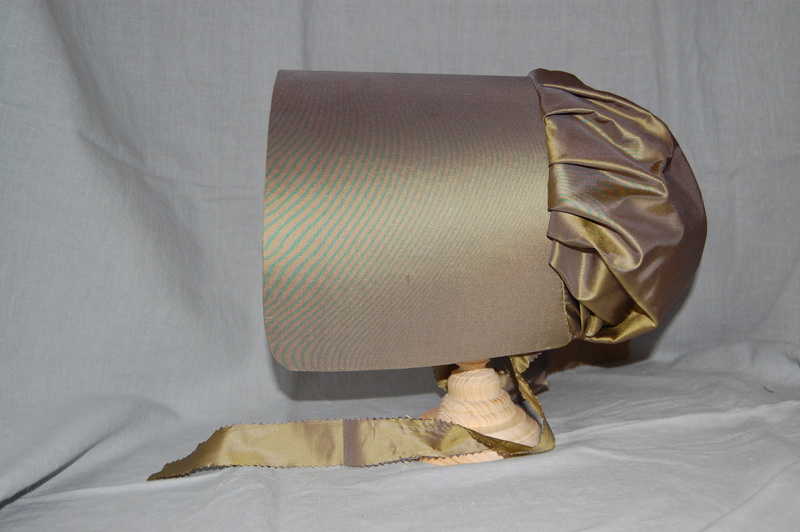 Fabric: Sort-of-changeable black and yellow silk taffeta in olive green for the body and ribbons, white linen for the caul lining and brim interlining, white poly taffeta for the brim lining, and pasteboard for the brim. Hours to complete: Five, perhaps? These are quick, so five would be from start to finish, not including agonizing in advance. Mr S’s day took a bit of turn. First worn: First by Mr S, who wasn’t feeling well, but to be carried along by me on March 7. I don’t always feel the need to enhance my anatomy; in fact, I rarely do, but then I started on the sacque. Ah, the sacque. I nearly abandoned the whole business but then I thought I’d look pretty silly dressed as the maid, or for George Washington’s funeral instead of his birthday party. I also don’t want to have a house littered with UFOs, because that is what my knitting stash is for. In order for the sacque to look right, I need hips. HIPS. And while I planned to make panniers AKA pocket hoops, a simpler and easier solution occurred to me. Hip pads: I’d seen them on Sharon’s site and thought I could at least try a pair. They’d help my poor fake quilted petticoat (FQP, long story), which will come in handy for a party in February. So I spent my New Year’s Day making hips and playing a bit with the sacque silk. Half hipped, or me, right after my hip replacement. Whole hipped: symmetrical, and wide. 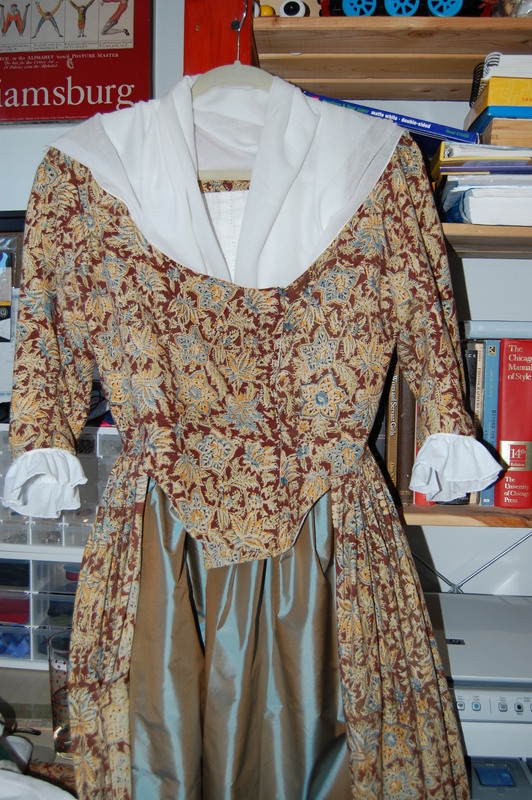 To make the hips, I started out by laying a piece of muslin against Cassandra, and tracing a waist arc. I worked between the muslin and paper to create a paper pattern, and then made up a muslin, which I filled with polyester stuffing and then tested under the FQP. Better, no? Then I added the seam allowance to the paper pattern (which you can download here and print at 100% if you have a waist in the 30 inch range and want enormous hips yourself) and cut four more of linen. After three episodes of Death Comes to Pemberly, I had hips. They weren’t quite the same size, but my right hip is larger or higher or something, so I put the smaller one on the right and the larger on the left to balance my own deficiencies. The alteration to the silhouette is pretty amazing, though Mr S did laugh. Perhaps this figure is an acquired taste. All I have right now to wear with the Celebration Spencer is a black petticoat, so I’d be rocking the 1799 George-is-Dead look. The story is that I have a real one basted onto a frame but I cannot fit both the frame and a sofa in the apartment. We chose sofa. I am sad but comfy. I’m particularly interested in remodeled gowns, not that I have the patience to make a ca. 1750 or 1760 gown and then re-make it, even though I suppose it would be the path to the greatest authenticity. In figuring out “what next” now that the pleats are stitched down and secured to the lining, and the front panels cut, and one even pinned, awaiting a seam, I looked at the sack/sacque in Costume Close Up. It’s both tiny and a polonaise, so it’s not the best example for me to follow, but when you’re trying to understand construction before you totally screw up take the next steps, you look at whatever details you can. That led me back to Colonial Williamsburg’s collections database, which I try to avoid because they don’t have stable permalinks to their records. However, they have good cataloging and an amazing collection, so it’s hard not to end up back there. Serpentine trim, no matter how appropriate and accurate, is not for me. I like the simple trim on the purple gown (padded furbelows), and will probably replicate linear, and not serpentine, trim.